On Thanksgiving weekend I indulged in a purchase of a baking extravagance — a bottle of Nielsen-Massey “Madagascar Bourbon” vanilla bean paste. I seldom mention brands here, but the name of this sounds so exotic that I couldn’t resist. I’ve wanted to try vanilla bean paste for ages, and now that I had some sitting proudly in the cupboard, I cast about for a recipe that would showcase the vanilla flavour as well as the lovely dark flecks of vanilla bean. 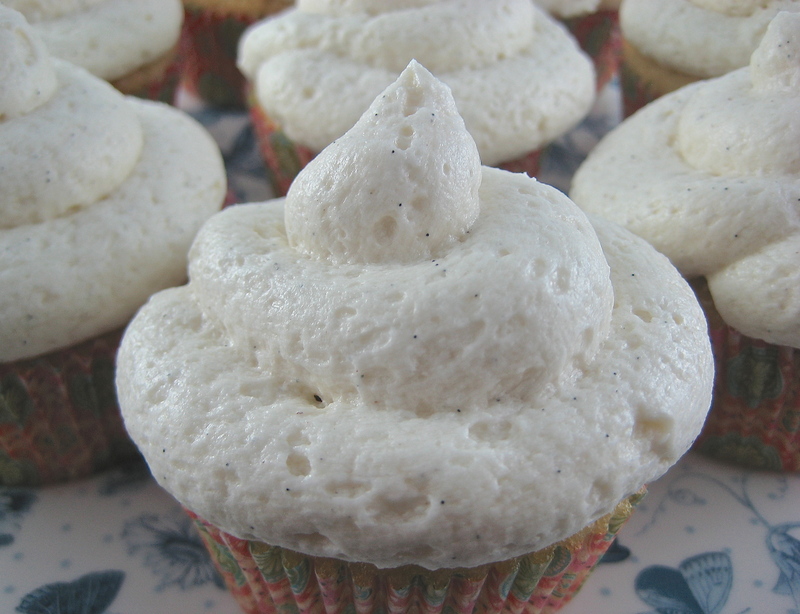 I decided to make vanilla cupcakes with vanilla frosting, hence the title for this post. 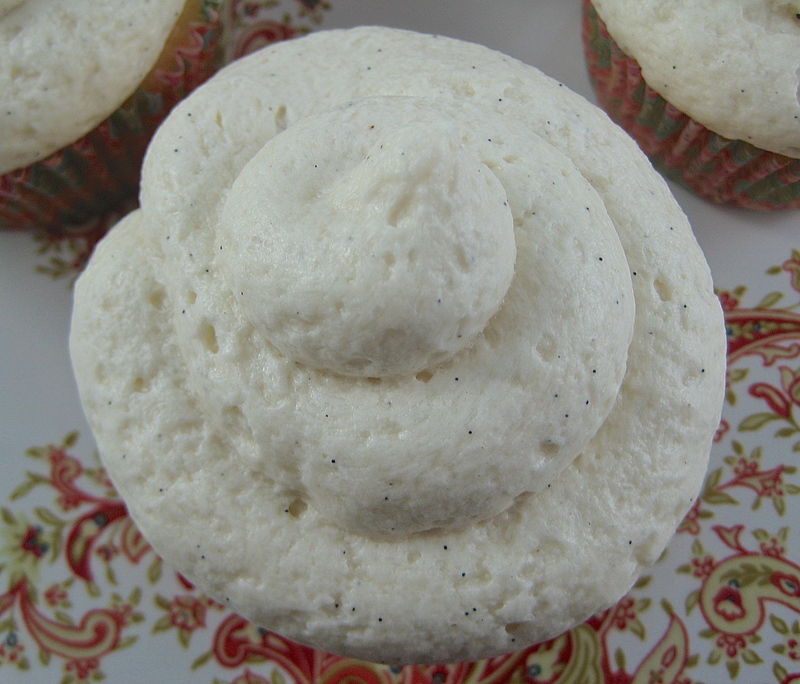 The cupcake is a basic, rather dense vanilla cake fancied up with vanilla bean paste instead of the usual vanilla extract. For the frosting, I wanted pillowy swirls of creamy buttercream, so I made a softer version than usual with the addition of some milk. Vanilla bean paste added intense flavour and visual interest via specks of the dark bean. I was pleased with how these turned out, with whimsical swirls of fluffy frosting atop the tasty little cakes in their pretty wrappers. The vanilla flavour was the star of this confection, as I had intended it to be. 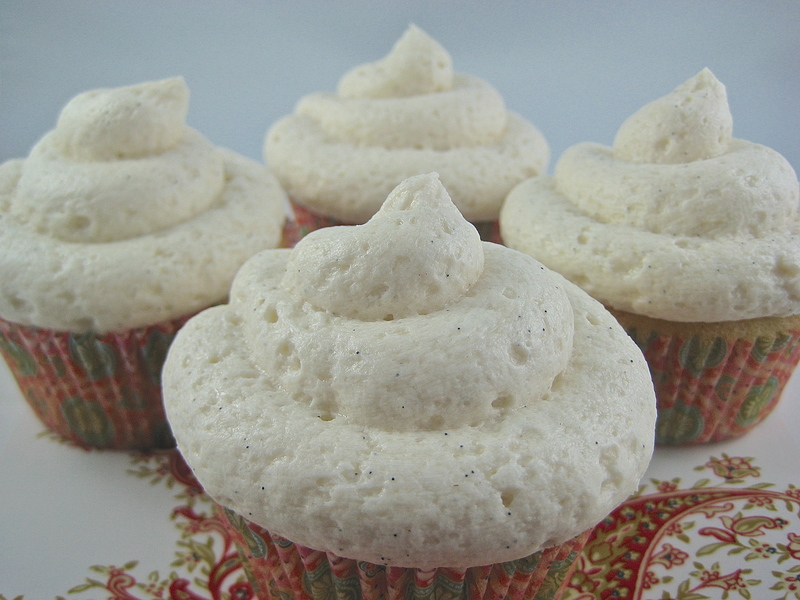 The Culinary Enthusiast enjoyed twice the usual amount of these Twice the Vanilla cupcakes! I looked at many vanilla cupcake recipes on the internet, before coming up with this combination of ingredients. Pre-heat oven to 350º and line a muffin tray with 12 cupcake papers. Cream the butter and sugar until light and fluffy, then mix in the eggs and vanilla bean paste. Combine the flour, baking powder and salt, and add alternately with the milk. Mix until combined, taking care not to overmix. 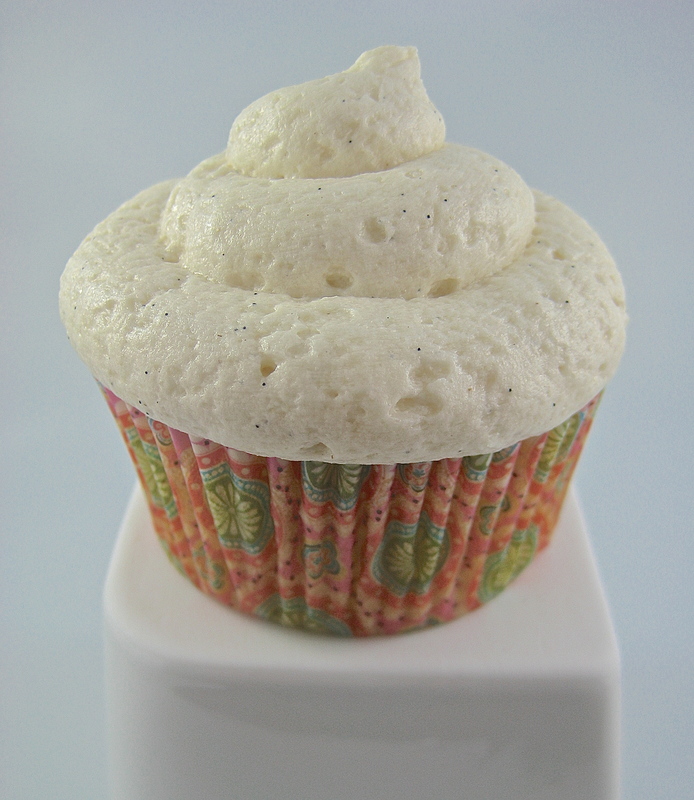 Scoop into prepared cupcake liners (an ice-cream scoop is a great tool for this), ensuring an even amount in each. Bake for 20 to 25 minutes, or until a tester comes out clean. Let cool in the tray on a rack for a few minutes, then remove the cupcakes and finish cooling on the rack. Using an electric mixer, whip the butter for a few minutes until light. Slowly incorporate the icing sugar, and scrape down the bowl. Add the meringue powder, milk and vanilla bean paste and whip at medium speed until the consistency is light and smooth. Scoop the frosting into a pastry bag fitted with the tip you desire. Roll down or twist the top of the bag, and pipe clouds of frosting onto the cooled cupcakes. Okay, ice cream is going on my list! I’m going to have to leave my day job if I’m going to get through everything on my blogging to-do list! Thank you, Mei, I appreciate your stopping by and commenting. Until earlier this year, I always left my cupcakes plain, and then I decided I’d like to develop my decorating skills. Really, it’s not difficult. I’ve started by using pastry tips with big openings in them, and it makes the decorating fast and easy. The more I do, the better I get, and so can you! Yummy cupcakes that are pretty are even better! Ya know…you might be onto something. Using a bigger pastry tip might be just what I need. I only have a set from the grocery store that I bought on a whim and they’re all small. Thank you for the wonderful suggestion! I’m not much of a baker, so, vanilla bean paste is new to me. Ice cream, though, is a different matter. In fact, the only time I buy vanilla beans is when I make French vanilla ice cream. Even so, I’d be willing to buy vanilla paste if only I had some sample to taste beforehand. Your delicious cupcakes would do very nicely, Mar. Do you deliver? I think that vanilla bean paste would work well in an ice cream too. I find the consistency of it not really ‘pasty’ as I’d expected; it’s more gel-like with vanilla extract and beans in it. It would be nice if I could send you a sample baked up in a cupcake, but they won’t even let me take an apple across the border so I don’t think a batch of cupcakes will pass muster either. So tell me again how you eat these delectable cupcakes without gaining weight? Maybe it’s because I can’t stop at just eating one…or two…or….Yummy!!!! LOL!!! I can believe that you have plenty of takers!!! I would be the first one in line…. Those are very pretty – almost like meringues! You’re right, the frosting does look meringue-like, I just hadn’t seen them that way. Thanks for helping me see these in a new light. 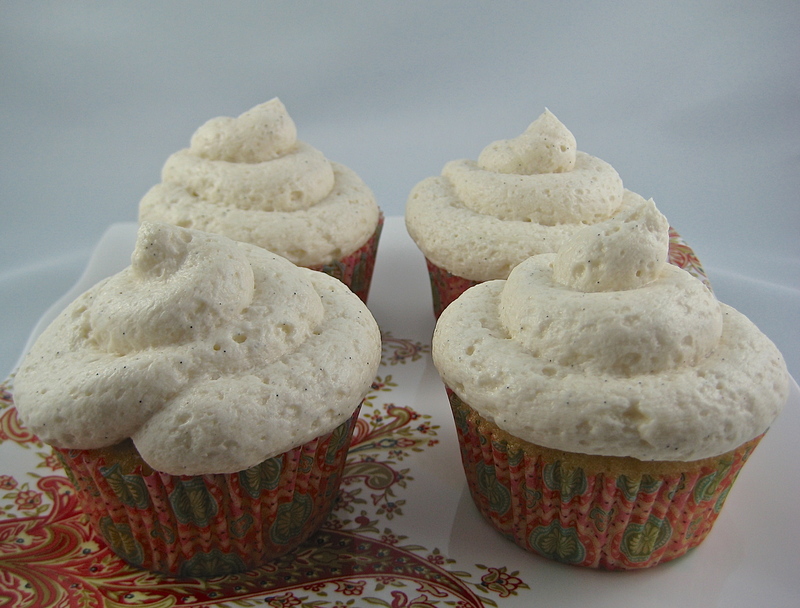 If the picture of my cupcakes made your stomach growl, I’ll take that as a real compliment! Beautiful and looks absolutely scrumptious!! We really enjoyed these, especially with that fluffy frosting! Thank you!